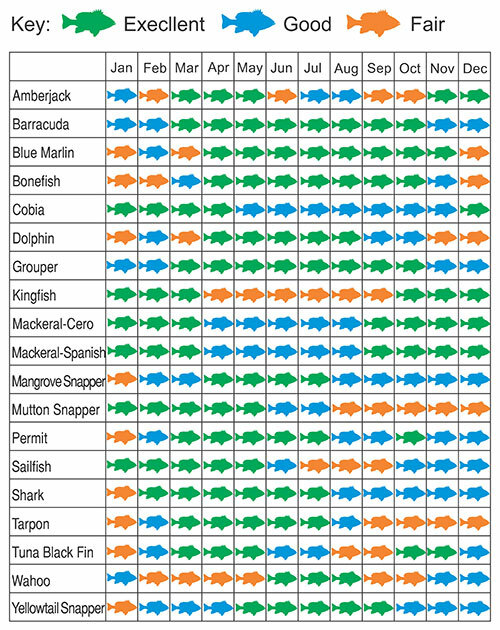 Please use the Key West Fishing Calendar below to decide what type of fish species and what time of the year you would like to schedule Seaborn Charters. Key West always has fantastic fishing year round. Particular fish species are more numerous at different times of the year than other species, because of migration patterns, water temperatures, bait and spawning cycles. We hope this Key West Fishing Calendar helps you to decide when to plan your Key West fishing charter with Seaborn Charters.